So, do you want one? PRESS RELEASE: Apple® today introduced iPad, a revolutionary device for browsing the web, reading and sending email, enjoying photos, watching videos, listening to music, playing games, reading e-books and much more. iPad's responsive high-resolution Multi-Touch™ display lets users physically interact with applications and content. iPad is just 0.5 inches thick and weighs just 1.5 pounds— thinner and lighter than any laptop or netbook. iPad includes 12 new innovative apps designed especially for the iPad, and will run almost all of the over 140,000 apps in the App Store. iPad will be available in late March starting at the breakthrough price of just $499. "iPad is our most advanced technology in a magical and revolutionary device at an unbelievable price," said Steve Jobs, Apple's CEO. "iPad creates and defines an entirely new category of devices that will connect users with their apps and content in a much more intimate, intuitive and fun way than ever before." iPad features 12 next-generation Multi-Touch applications. Every app works in both portrait and landscape, automatically animating between views as the user rotates iPad in any direction. The precise Multi-Touch interface makes surfing the web on iPad an entirely new experience, dramatically more interactive and intimate than on a computer. Reading and sending email is fun and easy on iPad's large screen and almost full-size "soft" keyboard. Import photos from a Mac®, PC or digital camera, see them organized as albums, and enjoy and share them using iPad's elegant slideshows. Watch movies, TV shows and YouTube, all in HD or flip through pages of an e-book you downloaded from Apple's new iBookstore while listening to your music collection. iPad runs almost all of the over 140,000 apps on the App Store, including apps already purchased for your iPhone® or iPod touch®. The iTunes® Store gives you access to the world's most popular online music, TV and movie store with a catalog of over 11 million songs, over 50,000 TV episodes and over 8,000 films including over 2,000 in stunning high definition video. Apple also announced the new iBooks app for iPad, which includes Apple's new iBookstore, the best way to browse, buy and read books on a mobile device. The iBookstore will feature books from major and independent publishers. Apple also introduced a new version of iWork® for iPad, the first desktop-class productivity suite designed specifically for Multi-Touch. With Pages®, Keynote® and Numbers® you can create beautifully formatted documents, stunning presentations with animations and transitions, and spreadsheets with charts, functions and formulas. The three apps will be available separately through the App Store for $9.99 each. iPad syncs with iTunes just like the iPhone and iPod touch, using the standard Apple 30-pin to USB cable, so you can sync all of your contacts, photos, music, movies, TV shows, applications and more from your Mac or PC. All the apps and content you download on iPad from the App Store, iTunes Store and iBookstore will be automatically synced to your iTunes library the next time you connect with your computer. iPad's brilliant 9.7-inch, LED-backlit display features IPS technology to deliver crisp, clear images and consistent color with an ultra-wide 178 degree viewing angle. The highly precise, capacitive Multi-Touch display is amazingly accurate and responsive whether scrolling web pages or playing games. The intelligent soft keyboard pioneered on iPhone takes advantage of iPad's larger display to offer an almost full-size soft keyboard. iPad also connects to the new iPad Keyboard Dock with a full-size traditional keyboard. iPad comes in two versions—one with Wi-Fi and the other with both Wi-Fi and 3G. iPad includes the latest 802.11n Wi-Fi, and the 3G versions support speeds up to 7.2 Mbps on HSDPA networks. 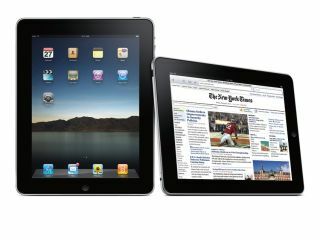 Apple and AT&T announced breakthrough 3G pre-paid data plans for iPad with easy, on-device activation and management. Continuing Apple's dedication to designing and creating environmentally responsible products, each iPad enclosure is made of highly recyclable aluminum and comes standard with energy-efficient LED-backlit displays that are mercury-free and made with arsenic-free glass. iPad contains no brominated flame retardants and is completely PVC-free. Apple today released a new Software Development Kit (SDK) for iPad, so developers can create amazing new applications designed to take advantage of iPad's capabilities. The SDK includes a simulator that lets developers test and debug their iPad apps on a Mac, and also lets developers create Universal Applications that run on iPad, iPhone and iPod touch. iPad will be available in late March worldwide for a suggested retail price of $499 (US) for the 16GB model, $599 (US) for the 32GB model, $699 (US) for the 64GB model. The Wi-Fi + 3G models of iPad will be available in April in the US and selected countries for a suggested retail price of $629 (US) for the 16GB model, $729 (US) for the 32GB model and $829 (US) for the 64GB model. iPad will be sold in the US through the Apple Store® (www.apple.com), Apple's retail stores and select Apple Authorized Resellers. International pricing and worldwide availability will be announced at a later date. iBookstore will be available in the US at launch. *Apple tested wireless battery life by browsing web pages and receiving email over an AirPort® network, never letting the system go to sleep during the test, and keeping the display at half brightness. This is a typical scenario of use on the go, resulting in a battery performance number that is very relevant to mobile users. **A properly maintained iPad battery is designed to retain 80 percent or more of its original capacity during a lifespan of up to 1,000 recharge cycles. Battery life and charge cycles vary by use and settings.